The basis of any energy monitoring system is the collection of energy usage data. The AtlasEVO Energy Monitoring & Management System utilises any number of ATLAS Loggers & MicroLoggers to record energy consumption information by counting pulse output signals from resource meters. The meters can be measuring electricity, gas, water, steam, or anything else, provided a pulse output is available. Volt-free contact pulse outputs are preferred although, open collector style outputs can also be accommodated. With loggers ranging in size from 4 to 104 channels (therefore recording information from 4 to 104 meters), the AtlasEVO system is able to accommodate extensive sub-metering programs. ATLAS loggers count the pulses they receive into 30 or 15 minute periods (with minute by minute logging an option). This data is stored within the logger's memory on a period by period basis & independently for each channel. The rate of pulse receipt on each logger channel is also used to calculate the present load (rate of consumption) and a predicted demand for the current period. All ATLAS energy monitoring system loggers can store at least a month's period data to prevent data loss if software communication issues arise. All stored data is available for download by the AtlasEVO system software at all times. The well proven and reliable Atlas IV Energy Monitoring loggers are available with four capacities; 8, 40, 72 or 104 channel and are supplied in IP65 steel enclosures either 400x400mm or 600x400mm in size. A number of communications options are available - direct RS232 or RS485 cable connection, fixed line or GSM modem, TCP/IP Ethernet, etc. Communications cable and pulse input connections are made via simple screw terminals. While being primarily mains powered (240V or 110V options), the Atlas IV Logger's PSU houses three standard D Cell batteries allowing full logging and communications operation to continue for a number of days* in the event of mains power loss. 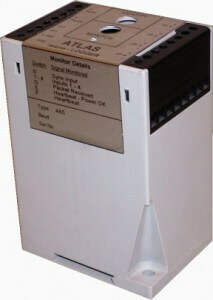 The ATLAS Energy Monitoring System MicroLogger is a 4-channel logger supplied in a DIN rail mountable, plastic enclosure. With dimensions of 110x75x55mm it can easily be installed within switch gear panels or a separate wall mounted enclosure to suit specific requirements. The ATLAS MicroLogger requires a 9-12V power supply but includes an on-board lithium battery to enable full operation for up to 24hrs* in the event of a loss of mains power. 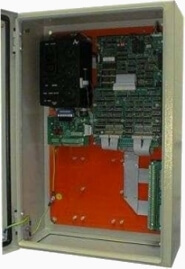 As with the Atlas IV loggers, a number of communications options can be specified (RS232, RS485, modem or TCP/IP Ethernet) with communications and pulse input connections again being made via screw terminals. *dependent upon number of channels in use, frequency of communication & type/capacity of batteries installed.